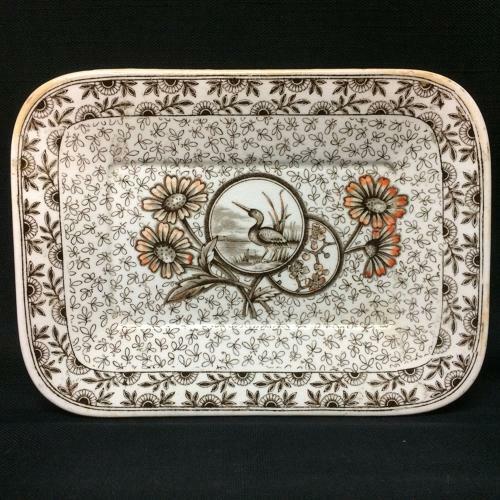 This wonderfully small Victorian aesthetic 7 3/4 " long x 5 5/8 " wide platter is transfer printed in brown and hand painted in orange luster. A delightful size in a fabulous pattern. The pattern features a fancy pin wheel flower border around a completely covered well with oversized daisy type flowers and a cartouche window of a Loon at water side. The piece is marked on the underside with an impressed registration mark, the pattern name and trademark that identifies the maker as Ridgway, a pottery maker working in Stoke on Trent in the Staffordshire region of England during the 19th century. Never Used. The piece is in great condition.